Knowledge Hunter: Information Architecture... who coined that thing? Information Architecture... who coined that thing? Currently we are getting surrounded by people calling themselves Information Architect. Hell, yeah, I call myself one! So where did that word come from? Quite some years ago (1997) I happened to be working on a project with John Thackara in Amsterdam. Bringing together people from two different fields: knowledge management and (interface) design. From the world of design we had quite an odd bunch of people: io360 from NY, Perspecta from Cambridge MASS, PlumbDesign, ... those people got me thinking about, what we call now IA. I asked one of them what his favorite book was on (interface) design, this happened to be INFORMATION ARCHITECTURE by RICHARD SAUL-WURMAN. Today we would call Richard's ideas Information Design, but still, his ideas come quite close to IA of today. As Christina Wodtke put it quite right: Pretty much before there was a web, before Jakob was going to war with design, before all that hoo-haw... 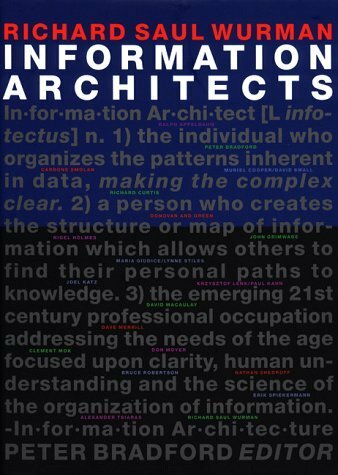 There was Richard Saul Wurman saying that someone should design information in a way people could use it, and he called this person an Information Architect.